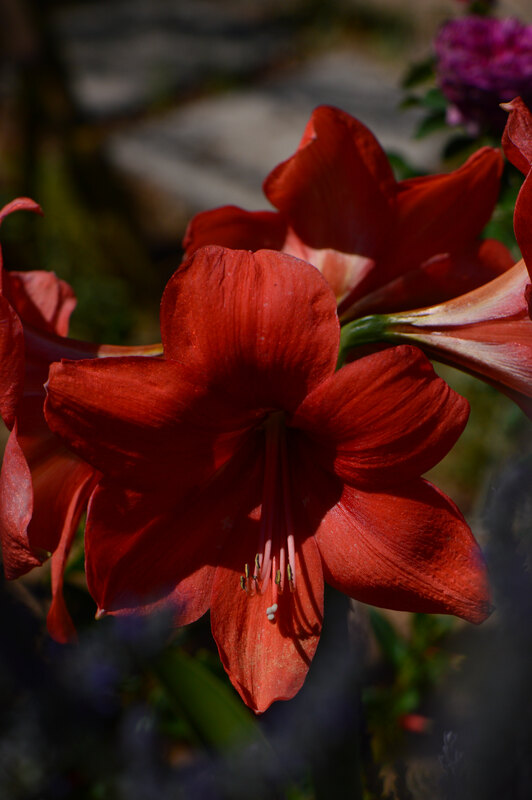 As temperatures have moved upward during the month of April, flowering has shifted to emphasize the more exotic plants. This is not to say that the standard garden fare is unavailable, but the borders are punctuated just now by some of the more unusual native and subtropical varieties. ...quickly transitioned to blooms belonging much more distinctively to hot climate conditions. 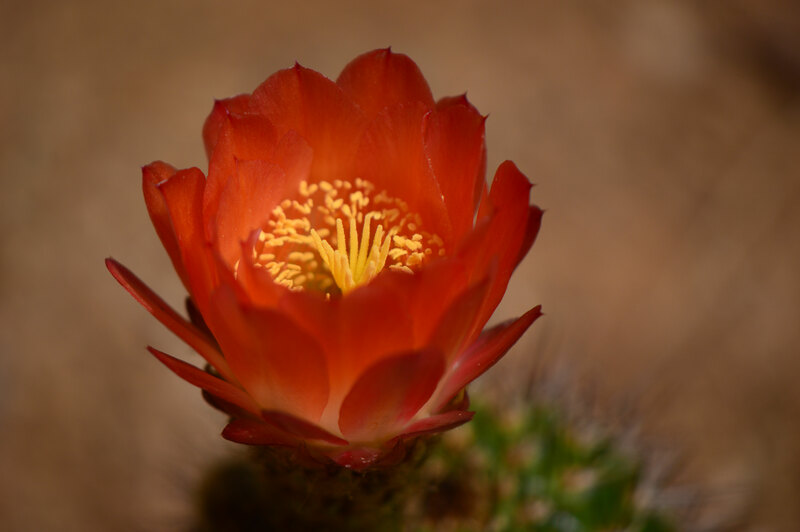 Perhaps the most spectacular came from a cactus. 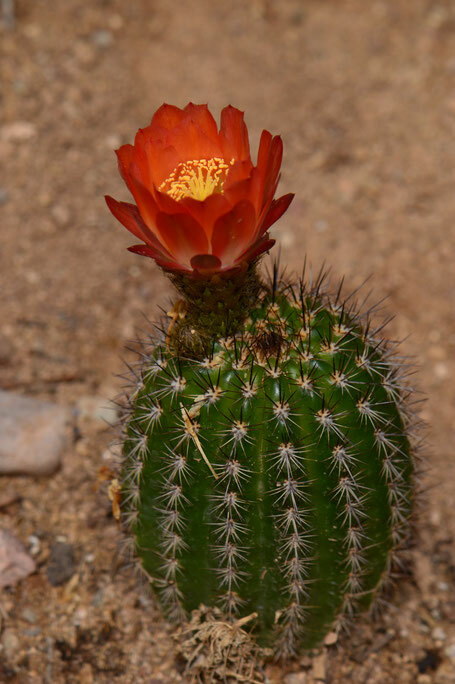 Here is the first bloom from Trichocereus grandiflorus. It's an enormous flower for the current size of the plant. There were also the tiny, brilliant wreaths of bloom on a couple of Mammillarias. This one (species name not available until I hunt it up!) 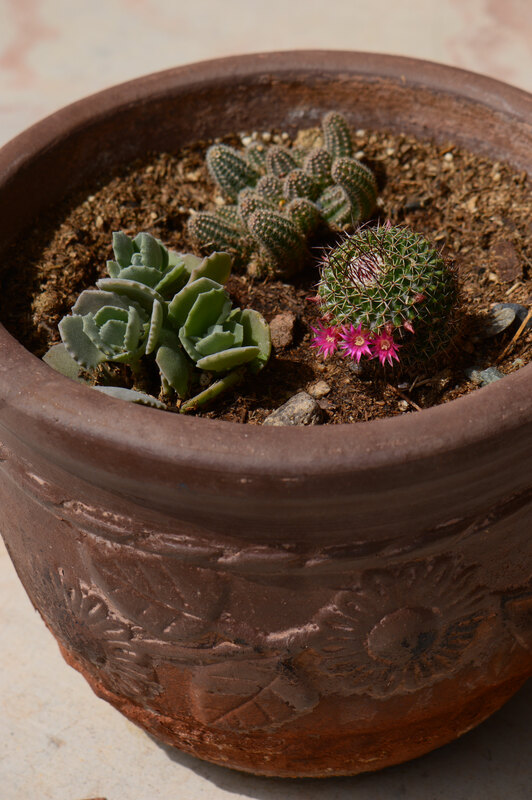 is part of a container planting of cacti and succulents. I have three of these now and have thoroughly enjoyed them. This is the newest so the plants have not grown much yet. There are a number of native southwestern plants in bloom now. One is Gaura (Oenothera lindheimeri "Belleza White"). 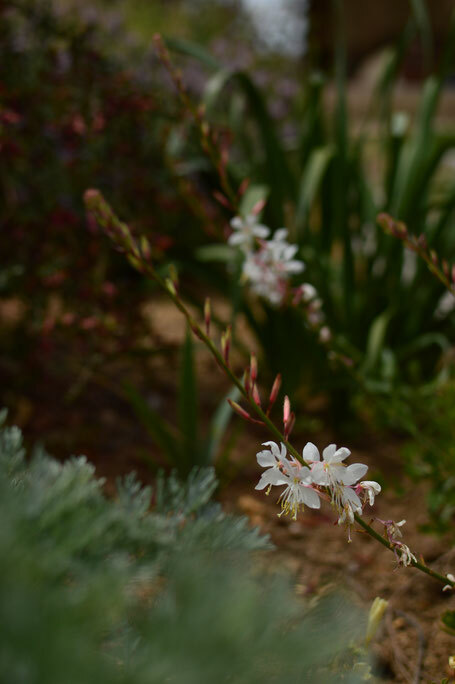 Originating in Texas and Louisiana, Gaura is amazingly reliable here in the low desert. A well-known denizen of the southwestern deserts is California poppy (Eschscholzia californica). 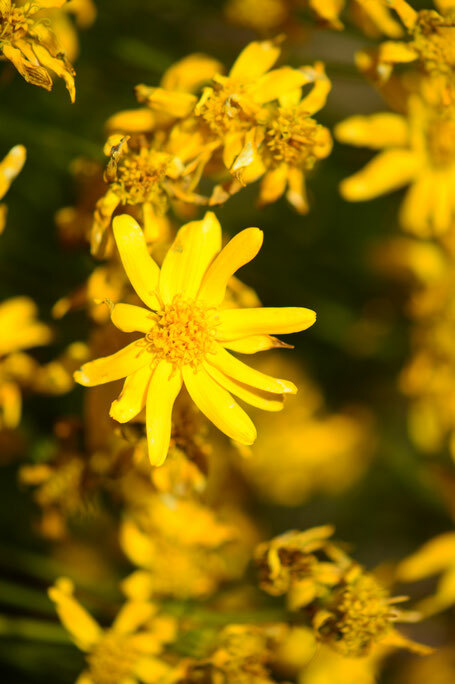 Though my garden certainly did not make the showing that the California deserts did this spring, the plants that emerged have livened up the garden considerably with their brilliant gold. And there are a few deep red ones from a batch that I struggled to start in the North Border. Perhaps I will have better luck with these next autumn! For now I am enjoying the ones that did arrive. Brilliant color also comes from Damianita (Chrysactinia mexicana). It is just going over after weeks of being entirely blanketed in bright yellow. 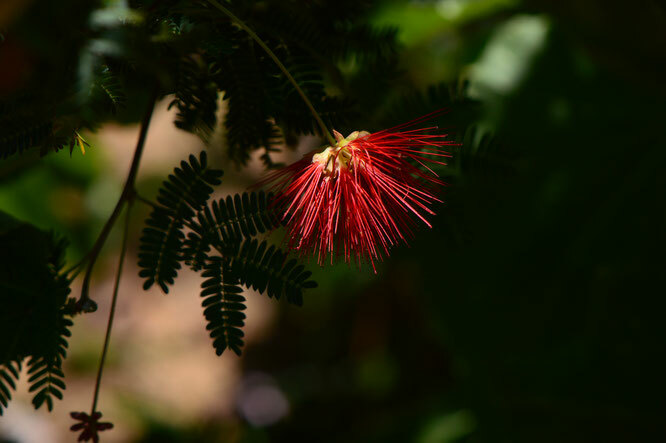 And there is more bright red from the fairyduster (Calliandra californica "Baja Red"). Then there are the heat-loving plants from elsewhere in the world. 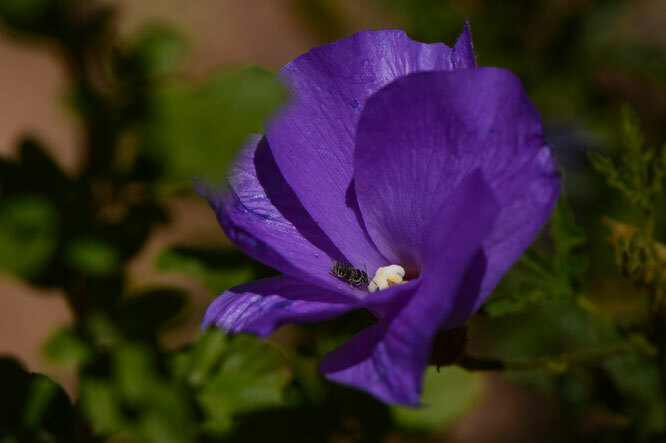 The most consistent bloom has surely come from the Australian blue hibiscus (Alyogyne huegelii, here with friend). 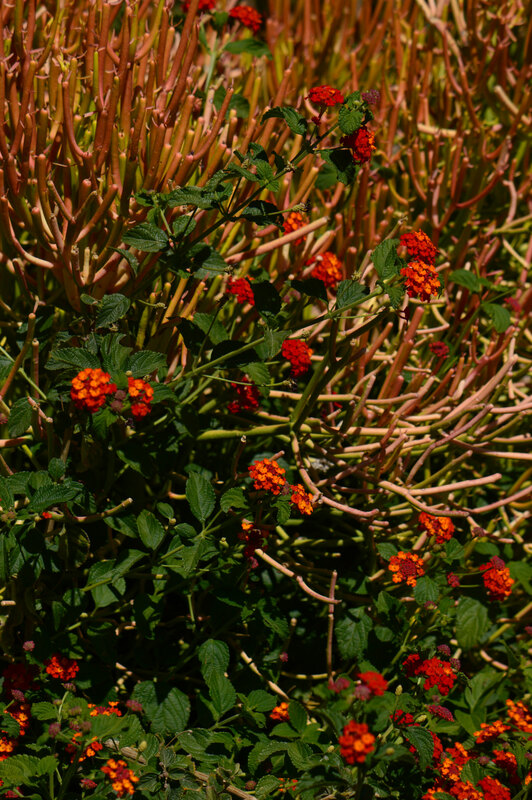 Lantana "Denver Red" needs to be cut back as it is now growing into Euphorbia "Sticks on Fire". 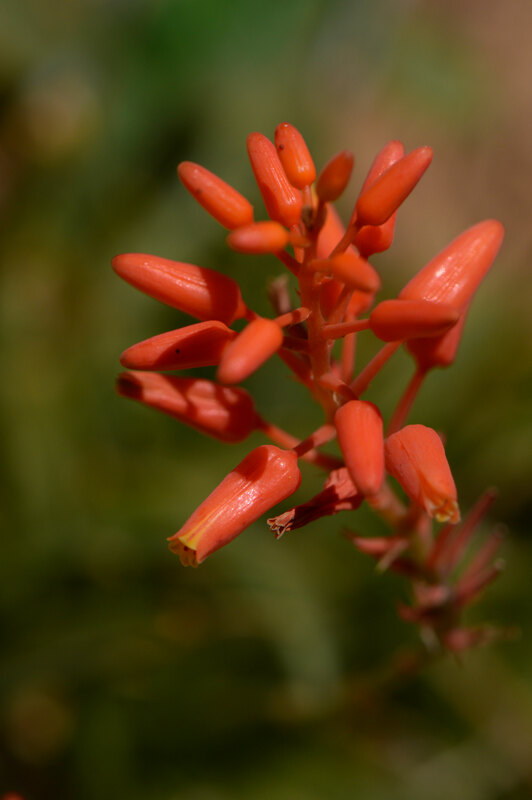 And a few aloe flowers are still appearing, these from "Firebird". I must post about roses, as this is their time also, but I wanted to share these more exotic flowers, which have been holding high revel as temperatures regularly top 90 F/ 32 C. They are among the privileges of gardening in the desert. just love seeing all these exotic species, some of which I recognise from tropical glasshouses that I have visited here in the UK. 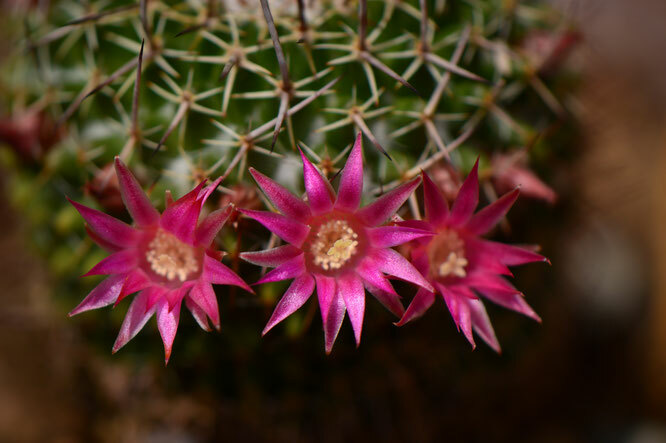 They are indeed the upside to gardening in the desert! Your garden is full of color, Amy! I've got only one true cactus but found myself eyeing more on a shopping trip this past weekend - they do have the most beautiful flowers! I love your red poppy too - so far, I've only had blooms on the white form down at the bottom of my slope. 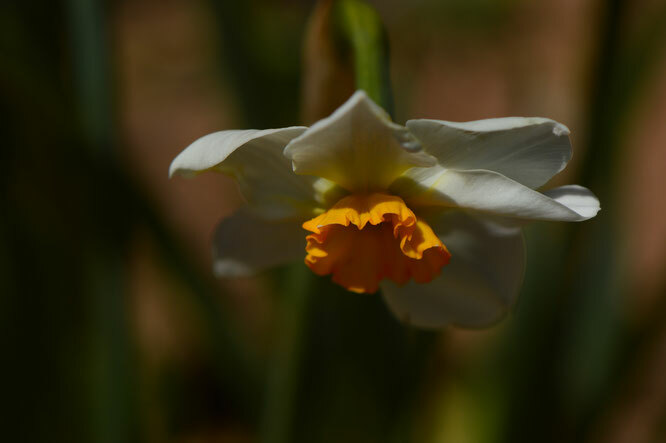 Isn't it amazing that you can grow narcissus and flowering cacti in the same garden. 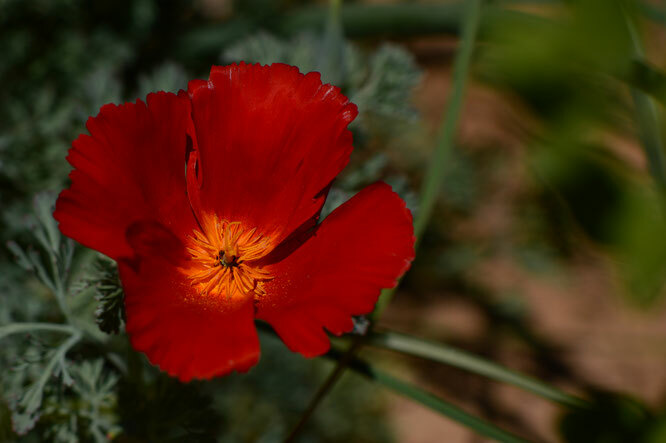 I love to see California Poppy in gardens. Kris - I loved your pictures of your white poppies. I'm hoping I can keep the two color strains growing separately... 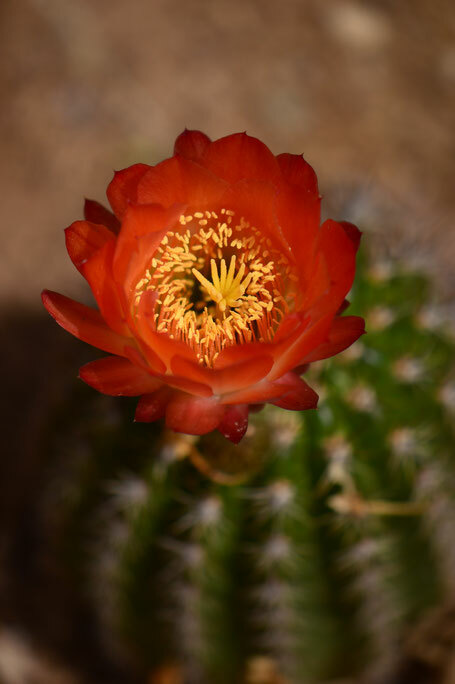 It took me awhile to warm up to growing cactus; it was a particularly bad poke from one of my rose bushes that made me say, why not?! (Though I still avoid most Opuntias!) Actually, though, most of mine are probably less hazardous than the agaves I'm growing - plus, those flowers...! Brian - Yes, I find it amazing - though truth to tell, I've had to select my narcissus fairly carefully ;-) I'm quite happy about the California poppies, especially the fact that the normal gold varieties seem to be settling in permanently! That is a great mix of tropical colour Amy! Your garden must look a treat! 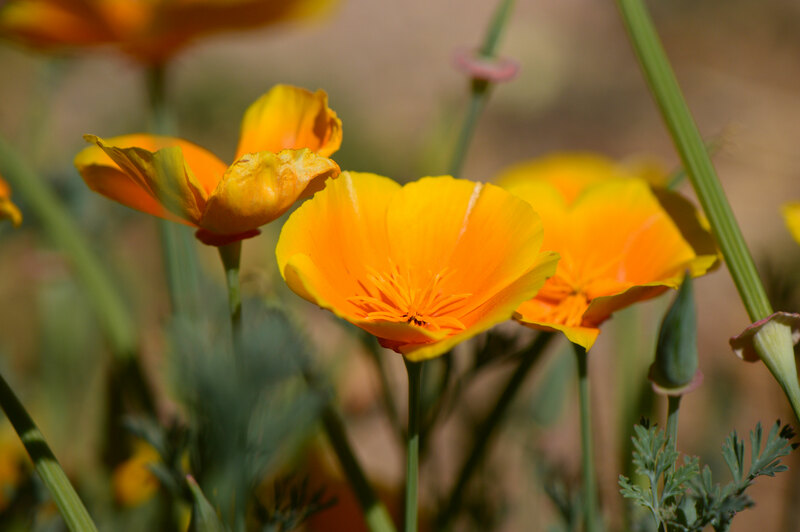 :) I really like Californian poppies, but the snails and slugs in my garden domtoo! And Gaura is always wonderful. I am not sure if mine survived the winter yet as the only sort I can grow is not reliably hardy here... we will see! Cathy - Thank you so much :) So far, no snails or slugs here; our gritty soil gets too hot in summer and they would cook, I'm sure! That may change as I improve the soil and use more organic mulches... I do hope your Gaura has survived. I didn't realize there was so much variation in hardiness, but then, until recently I had no idea how many different varieties had been developed! 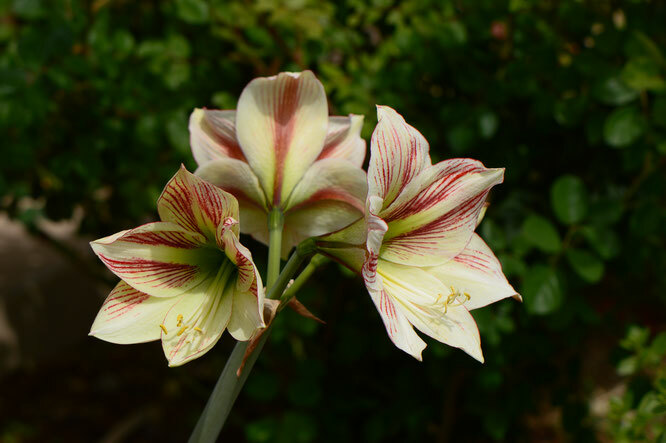 ooh I don't expect Hippeastrum in a desert garden! We do have snails - which the hadeda ibis eat - but I don't see them on the Californian poppies. They prefer to chew the leaves on my succulents. Diana - Yes, it's surprising about the Hippeastrums, isn't it? 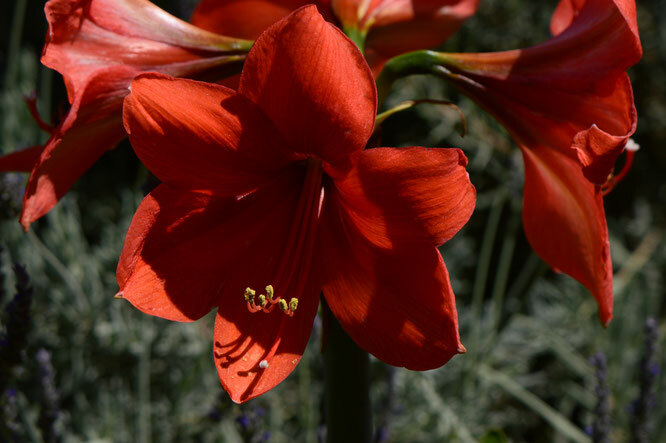 They are some of my favorite bulbs here, though, partly because their sumptuous size and colors, and partly because they grow so easily. One curious thing about them is that they remain evergreen year-round in the garden. It would be a tad simpler if they would go dormant through part of the summer. As it is, they do require an occasional soaking, though not much. Their heat-tolerance has been admirable, and of course I keep them out of full sun. I can do without the snails and slugs, though most of the gentler succulents can't survive summer here anyway! But cactus and agaves do their bit!